In recent years the Ministry of Culture launched the Youth Festival for Theatrical Arts and organizes Cultural Weeks for most of the Arab countries, a phenomenon which was very successful during the celebration of Damascus as Capital of Arab Culture. The Ministry of Culture invites Arab and foreign groups and performers to the country’s international festivals like the Busra Festival or the Damascus Theatre Festival. The Jazz Festival in the ancient citadel of Damascus — the world’s oldest city that is still inhabited — was initiated in 2004, partly funded and organized by the Swiss embassy. Since 2008 the festival has been the responsibility of the Syrian Trust for Development (STD), in its capacity as a national cultural organization. Now the festival receives mixed public-private funding, a novelty. The AllArtNowFestival is an international new media art festival (Damascus). The Syndicate of Fine Artists (early 1970s, Damascus) and the Union of Visual Artists (2004) dominate the field of visual and applied arts. The Syndicate gives galleries permission to hold exhibitions. 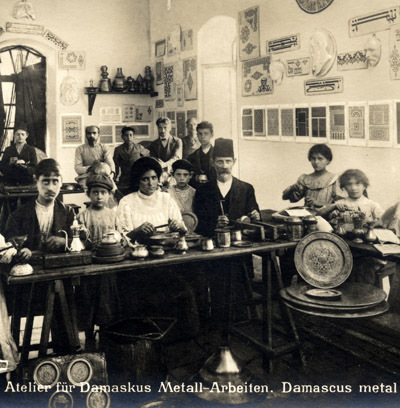 One of the first art exhibitions in Syria was held in 1928 at the Syrian University. Afterwards the university continued to be an incubator for artists, arranging collective and individual exhibitions. The Union protects the artists’ interests and implements regulations concerning health insurance, social security and a pension fund, as well as establishing specialized artistic associations. A decision made by the General Meeting of the Syndicate of Engineers in 2008 resulted in the establishment of the Syrian Architects Association, a scientific and cultural body. The association looks after the country’s architectural heritage and seeks to develop Syrian architecture and raise educational, technical and professional standards. In addition, the association seeks to employ architecture in the service of society and its environmental, urban and social texture, and also to promote the study of architecture. After their introduction in 1908, the number of cinemas increased to about 120 in 1963. Nowadays there are less than 40, of which 25 are located in Damascus and Aleppo. The number of seats is around 15,000, with an average of less than one seat per l000 inhabitants. According to a study by the General Establishment of Cinema (founded 1963), the total revenues amount to around 41 million pounds. Several factors are responsible for the general decline. One of them was the law on Restrictions to Import (1) which prohibited owners of private cinemas to import Arab and foreign films. It obliged them to screen the films imported by the General Establishment of Cinema (GEofC). The law was revoked in 2003, enabling distributors and cinema owners to import whatever films they wanted. Other factors include taxes on all imported films, on activities ranging from the import of accessories and equipment for modernizing cinemas to admission tickets, the payment of 10% of the revenues and a commission to the General Establishment of Cinema, and taxes and dues to be paid to other bodies, such as the General Establishment for Advertisement, the Ministry of Local Administration (fees for stamps and cleaning), and the Ministry of Finance (on profits). The fact that cinemas used for other purposes are expropriated is also important. Since the founding of the GEofC many difficulties have been encountered, including the economic crisis, a lack of technical knowhow and qualified managers, a clash with the private sector about conflicting goals, varying tasks, and different working methods and administration. The State Planning Commission has set up a number of projects introducing legal changes to facilitate the participation of the private sector in cinema production. These include the establishment of a national fund to support the film sector within the framework of the Chamber of Cinema and TV Industry, and the encouragement of private and other banks to invest in this field. Official film production is in most cases no more than 1 or 2 films a year. These are festival films that are not commercially marketed. On the other hand, film is not yet considered as a cultural industry. The I.eish Troupe (1999, Damascus) aims to construct a Movement Theatre vocabulary, particular to the current Arabic context, in order to remove the traditional boundary between performers (musicians, singers, dancers and actors), artists and designers on one side, and the audience on the other. The Leish Troupe is licensed by the Union of Artists (2).The Dar AI-Assad Opera House for Arts Culture (2004) attempts to boost the cultural scene by bringing international performers to the country. Currently, many Syrian musicians, both individually and in musical groups, are involved in reviving the Syrian musical heritage. Shedding light on the various musical cultures in Syria, especially the Assyrian, Armenian, and the Kurdish ones, is central to the Bridges project. The project enjoys the support of the MOC. Fine arts centres, affiliated to the MOC (with 15 centres in most governorates), play a key role in developing the skills of amateur artists of all ages. They require artistic skills. Students in these centres study for 2 years and are awarded official art certificates, issued by the MOC after successfully presenting a graduation project. The Al-Assad Institutes, affiliated to the Revolutionary Youth Union, play a vital role in amateur music education, particularly for children and teenagers. They stage concerts and encourage them to pursue their education further. In a number of governorates amateur theatre groups, linked to the MOC, are still active. The MOC launched an annual amateur theatre festival in 2006. The Syrian Orchestra for Arab Music and the Aleppo Music Band (Qadry Dalai Band) were founded by amateurs. Artisans (glass, clay, crafts etc.) are members of the General Craftsmen’s Union. Resolution No 1294, based on law No 13 (1990). According to Presidential Decree (No 192). [♥] From: Syria by Reem Al Khatib and Rana Yazaji published in ‘Cultural Policies in Algeria, Egypt, Jordan, Lebanon, Morocco, Palestine, Syria and Tunisia. An introduction’, Cultural Resource/European Cultural Foundation, Bookmanstudies, 2010, 195-198.